I wish some dude would ask me out on a date so I could suggest we go see F&F3:TD, and then we could give each other fake bloody noses with my leftover zombie costume blood and hold hands and make out and play skee-ball and stuff. It’s just that time of year, you know? Are those my birds? I need those. Yesterday I turned 29 years old. I don’t understand what the big fuss is about aging; I’m not scared of 30 or anything. I mean, aside from the part where your body eventually stops working and you die, I don’t see what’s so awful about getting older. Somewhere around 23, my life starting getting a lot more fun, although, frankly, 28 turned out to be a pretty messed up year, and I was very eager to have it behind me. As far as birthdays go, 29 took the cake, even though there was no actual cake, but lots of dim sum and champagne and pizza and rice krispie treats. It was surprise after surprise, from when I woke up until I went to bed. Seriously, everyone I know, near and far, managed to go out of their way to give me one of the best days of my life, and I feel really loved, and really lucky. Also, I got to drunk drive a pirate ship. 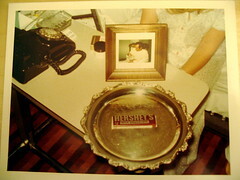 If you want to see pictures (and hear the story about how I got my middle name), check out the set on Flickr. If I know you, thank you for being awesome! Cringe is tomorrow night, Wednesday, June 7. Don’t even tell me you’re not going to be there because I can’t take any more of your lies. Anyway, we do not have Oklahoma accents. Our father is from Alameda, California, and our mother was born in Dallas, Texas, and raised primarily in Canada. Oklahoma accents are awful things, devoid of any of the charm of the Southern or even Texas accent. To speak in an Oklahoma accent, just try to sound uneducated and prickly. You never SIT on the porch, you SET on it, and you never quite get around to SETTIN’ on it because you are forever FIXIN’ to do so. As you can imagine, this is a really fun way to talk, and it makes my brother’s stories about the barbecue restaurant where he works that much funnier. His barbecue restaurant offers an All You Can Eat Ribs Night on Tuesdays, (pronounced “Tues-dee”), and they often run out of ribs around 8 o’clock. Run out of ribs. On All You Can Eat Ribs Night. The humanity. Inevitably, all of those topics disintegrate into us quoting funny movies back and forth to each other. Some people communicate via words and expressed emotions and ideas, but my brother and I are okay just letting Dr. Peter Venkman or Tom Servo do the heavy lifting for us. Speaking of being lazy, last night during dinner I got some Caesar salad dressing on my glasses. (I also got some in my hair, but that’s not the point right now.) I dealt with this by sliding them a little further down my nose and holding my head at a precise angle so that I could watch Law & Order: CI without having to get up and actually clean my glasses. Then, after Law & Order, I changed the water in my fish’s bowl, spending a good fifteen minutes AT THE KITCHEN SINK with the WATER RUNNING, and still didn’t clean them because that would have meant TAKING THEM OFF OF MY HEAD and I was tired. So I woke up today and spent at least ten minutes writing this post, my chair scooted up close to the screen and squinting, before I was like, OKAY, FINE, I WILL CLEAN MY GLASSES, GOD! It took all of one minute. What is wrong with me? God forbid I have to MOVE EXTRA MUSCLES in order to MAKE MYSELF COMFORTABLE. I should totally have children someday. They will go to school coated in maple syrup and not wearing shoes, not because I am too lazy to tie them, but because I am too lazy to buy them any. Jesus Brielle, you want to leave the house AGAIN this week? Mommy is busy settin' here right now. Why don’t you go play with Mrs. Butterworth and ask her if she wouldn’t mind making you dinner. 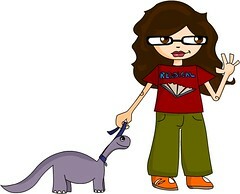 The super-awesome Andrea Spencer made this illustration of me taking my pet dinosaur to the Book Fair, which is arguably one of the most important parts of my day, up there with eating a balanced breakfast, or passing out on top of my covers with my lights, stereo, and clothes still on. As someone whose only artistic flair was drawing plaid boxes in the margins of my notebook all through school, I am so envious of her talent it makes me bite my own fist. Also, back when Friendster first started, Andrea listed her "who she wanted to meet" as "grim death," and to this day when I remember that, I'm always like, damn, that's good! I wish I'd thought of that first! Anyway, this is officially my first commissioned artwork, meaning I Have Arrived and I'm sure now I'll start being invited to parties with themes and trust fund kids and tons of coke. Oh, wait.